New York, NY – Yagull’s official debut for MoonJune Records, ‘Kai’, finds the band expanding its post-rock chamber soundtrack concept to great effect. The result is a simmering sonic bouillabaisse, chocked full of choice ingredients which delectably merge to blur the lines drawn by traditional genres – delightfully teasing the palette, while appealing to an expansive range of music aficionados! The group delivers twelve songs on this joyous outing: eight brand new compositions; two tunes from Films, reworked and revisited; plus, two tastefully-revised classic rock covers. The tracks showcase Yagull’s considerably potent stylistic capacity, making for a savory, finely-polished sophomore release. This new effort finds Yagull now launching itself from a duo framework – with Sasha Markovic being joined by the extraordinary pianist, Kana Kamitsubo – this most special of occasions is perfectly accentuated by a host of guest contributors; featuring fellow MoonJune international recording maestros, Beledo (guitar, lute), Dewa Budjana (guitar) and Marko Djordjevic (drums), and many other great musicians. With ‘Kai’, Sasha, Kana & company have embarked on a majestic journey that will appeal to a broad range of listeners… and carry them along for the ride! ‘Kai,’ represents big musical and personal changes for group founder, composer, producer, and guitarist, Sasha Markovic. Yagull has officially became a duo with the addition of Sasha’s most challenging collaborator up until this time, pianist extraordinaire Kana Kamitsubo. Sasha and Kana’s partnership went further as they became husband and wife. Album ‘Kai’ and the title track are named after their son born in 2014. Picking up where the first Yagull CD, ‘Films’ left off in 2012, ‘Kai’ expands the post rock chamber soundtrack concept exploring new structures written around acoustic guitar, bass, percussion and acoustic piano. 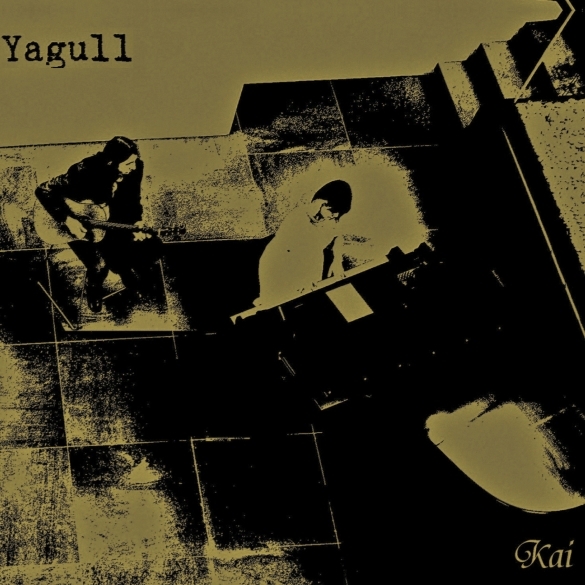 Yagull as a duo has an increased crossover potential for attracting listeners that may not be dialed into any of the specific genres baked into this release. Yagull delivers eight brand new compositions, two tunes from ‘Films’ revisited ( Dark, Sound Of M ) plus two covers for this sophomore release. The tracks range from “North” which exploits Kana’s mastery of creating evocative mood and space for Sasha to play, folksy “Z-Parrow” while “Omniprism” drifts into progressive rock ambiance. Methenyesque tune “Blossom”, leaves space for special guest Dewa Budjana to shine with another beautiful, lyrical solo. The title track for their son emotes a melody that can easily go alongside “Waltz for Debby” by Bill Evans in any play list. Sasha once again wears his affection for classic rock as a badge reworking the Free song, “Wishing Well”, which was also passionately performed by the late Gary Moore, as well as Deep Purple’s “Burn”. Beledo’s majestic lute introduction pays a homage to Deep Purple’s live version from the ‘Made In Europe’ record. Yagull are also joined by several guest musicians, the extraordinary and diverse line up hailing from eight different countries, including fellow Moonjune international recording artists Beledo (guitar), Dewa Budjana (guitar) and Marko Djordjevic (drums), as well as the long time collaborator flutist Lori Reddy, Anthony Mullin from The Blackfires (guitar), Jackson Kincheloe from Sister Sparrow & The Dirty Birds ( harmonica ), Gabriel Nat (clarinet), Wen Chang (violin) and Yoshiki Yamada (upright bass). ‘Kai’ has set Yagull on a journey that will appeal to wide range of listeners. This is essential MoonJune music.